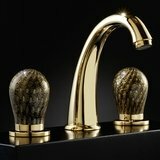 So you just purchased your modern bathroom sink from Maestrobath and you have either received it already or it is on its way to you. 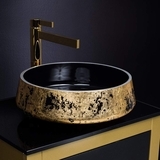 We care very much about your full satisfaction and our products and we want to make sure that when you step into your gorgeous bathroom, you are presented by the luxury and modern vessel sink you purchased like it was day one, every day. 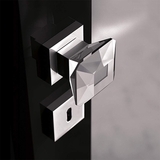 Therefore, I think it is perhaps a nice idea to provide some information and tips on installation. Now before you do anything I must say that this is by no means a professional installation manual and may not contain all the steps required for installing a luxury item like yours, so we think it is a good idea to seek the help of a professional. It may also be a nice idea to direct your contractor to review the information on this page just to make sure the installation goes smoothly. If you are a contractor, well, thank you for spending some time reviewing these information to ensure the safety of your client and their investment. 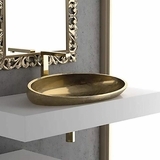 a) Take your modern vessel sink safely out of its box and place it on your modern bathroom vanity or any other sturdy surface. This is the time to thoroughly look all around your new bathroom sink and make sure there are no damages. We do this for every product before we place them in the box but accidents happen during shipping. Remember as long as you have not attempted to install the vessel sink you can return or exchange it for any reason during the time period allowed. a) The great thing about having a vessel sink is that it can simply sit on top of any cabinet or vanity. You do need to make sure, however, that your cabinet is strong and sturdy to support your luxury vessel sink. Some vessel sinks, for example, are made of stone and will be quite heavy. b) The total installed height of your bathroom sink must be between 30 to 36 inches. Take into consideration the height of the sink when purchasing a vanity or console to make sure that the sink will be placed at a comfortable height. c) The vanity top will need to include holes for the drain, faucet(s), and any other optional items such as modern soap dispensers. The drain hole on all MaestroBath vessel sinks is 1.5 inches in diameter which is a european standard drain size. d) Make sure to plan on what kind of modern bathroom faucet you will be using in order to figure out the number of holes needed on the vanity. This number may be zero (for wall mounted faucets), one (for single handle faucets), or two (for two separate faucets for hot and cold water). 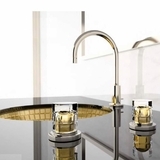 Install the modern faucet prior to installing the sink since the sink may block your way to instal the faucets and you definitely do not want to damage your newly installed sink in that process. a) Place the vessel sink on the vanity and align the drain hole. b) Use a ring to secure a bowl-shaped sink on a flat vanity. And don�t worry, we have also designed rings specifically for this purpose and to protect the sinks while aesthetically complement them. 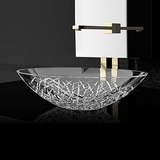 c) You will not need a ring for vessel sinks that sit flat on the vanity. b) Insert the drain from the top into the drain hole. The drain assembly should only contain the rubber sink washer at this point. c) From below, insert the rubber flat washer and push it as far up as possible. d)From below, insert the plastic washer. e) From below, insert the locknut and screw it in against the plastic washer, rubber flat washer and the underneath of the vanity. It is extremely important that you do NOT exert too much force when tightening the locknut. Over-tightening the locknut may result in breaking, cracking or deforming your vessel sink either immediately or in a short period of time and it may even cause injuries as a result of shattered crystal. Consult a professional if unsure about this. Stay safe and protect your investment. f) Plumber�s putty or silicone is not required unless if your contractor or plumber recommends it. i) Plumber�s putty may be used to watertight any space between the different parts such as the drain and the vessel sink or vanity. Remember to use or recommend a stain-free plumber�s putty in order to av oid any stains on your luxury vessel sink and/or vanity. ii) Silicone may be used as an alternative to plumber�s putty but it will present some challenges in case you need to uninstall any parts. a) At this point you are ready to instal the rest of the plumbing such as a P-Trap or a U-Trap. a) Once all the pipes are securely in place turn on the water and check for any leaks. b) If necessary, fill the vessel sink entirely with water to further make sure that the plumbing can withstand the full pressure of a full sink. 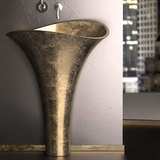 We hope you find this MaestroBath vessel sink installation guide informative and useful and as always, we will appreciate any comments or suggestions regarding this matter. On behalf of the MaestroBath team we hope you enjoy your new luxury vessel sink(s) for years and years to come.